SUMMARY: Spinal dural arteriovenous (AV) fistulas are the most commonly encountered vascular malformation of the spinal cord and a treatable cause for progressive para- or tetraplegia. They most commonly affect elderly men and are classically found in the thoracolumbar region. The AV shunt is located inside the dura mater close to the spinal nerve root where the arterial blood from a radiculomeningeal artery enters a radicular vein. The increase in spinal venous pressure leads to decreased drainage of normal spinal veins, venous congestion, and the clinical findings of progressive myelopathy. 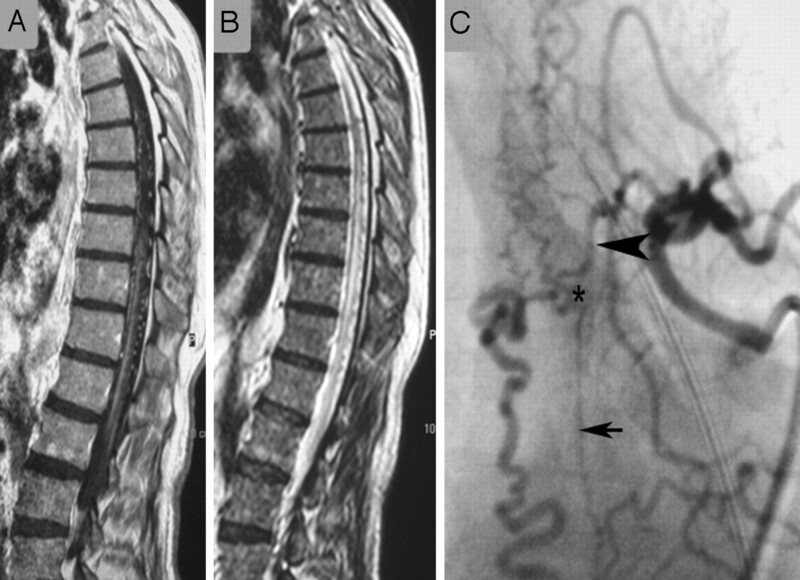 On MR imaging, the combination of cord edema, perimedullary dilated vessels, and cord enhancement is characteristic. Therapy has to be aimed at occluding the shunting zone, either by superselective embolization with a liquid embolic agent or by a neurosurgical approach. Following occlusion of the fistula, the progression of the disease can be stopped and improvement of symptoms is typically observed. Despite being the most commonly encountered spinal vascular malformation, spinal dural arteriovenous fistulas (SDAVFs) are rare and still underdiagnosed entities, which, if not treated properly, can lead to considerable morbidity with progressive spinal cord symptoms. Because presenting clinical symptoms are unspecific, the neuroradiologist is often the first clinician to raise the possibility of this diagnosis, which initially rests mainly on MR imaging. For a thorough understanding of the disease and for planning the therapeutic strategy, however, selective spinal digital subtraction angiography (DSA) still is necessary. 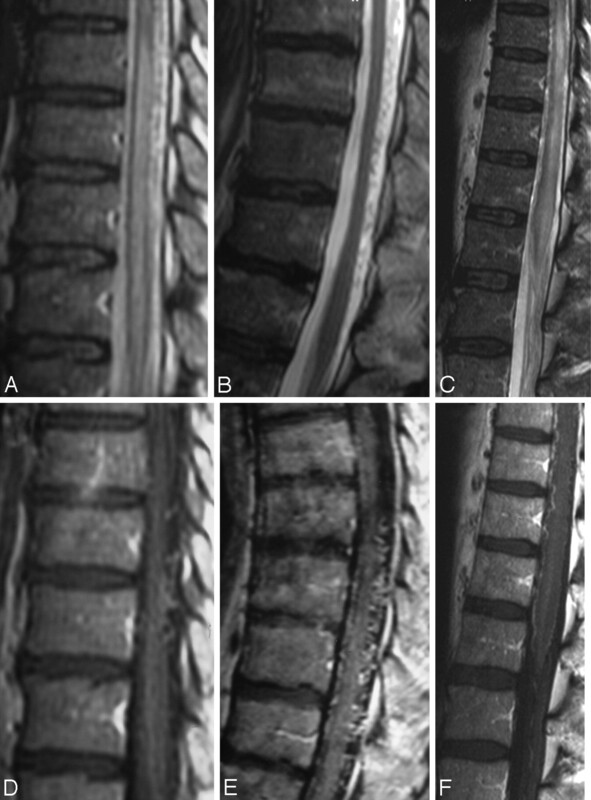 The aim of the following article is to review the epidemiology, etiology, clinical and imaging features, and therapeutic approaches of this type of spinal vascular malformation. Because an understanding of spinal vascular malformations both from an etiologic and pathophysiologic standpoint is based on the spinal vascular anatomy, we will start by briefly describing the salient features of the spine and spinal cord arterial supply and venous drainage followed by a classification of spinal vascular malformations in general and a classification of dural arteriovenous (AV) shunts in particular. The intrinsic network of the spinal cord arteries can be divided into central or sulcal arteries from the anterior spinal artery on the one hand and, on the other, into the rami perforantes of the vasocorona, which supplies the periphery of the spinal cord and is derived from both the anterior and the paired posterolateral arteries.10 The venous drainage of the cord is via radially symmetric intrinsic spinal cord veins and small superficial pial veins that open into the superficial longitudinal median anastomosing spinal cord veins. These veins follow more or less the arteries (ie, the anterior and posterior median spinal veins) but have many anastomoses (including transmedullary anastomoses) creating a network with commonly more than 1 anterior and posterior vein.8 They may use the roots as a vehicle to reach the epidural plexus and the extraspinal veins and plexus, with a reflux-impeding mechanism within the dura mater.11 The transition of a median vein into a radicular vein shows the same hairpin-shape as the artery. At the superior cervical part, these veins can run through the occipital foramen to connect the vertebral plexus to the inferior dural sinuses. Drainage of blood from the spine occurs through the valveless internal and external venous vertebral plexus, connected to the azygos and hemiazygos venous systems. Spinal cord AV malformations are (like their cerebral counterpart) shunts, which are fed by arteries normally supplying the neural tissue (ie, the intrinsic arteries of the spinal cord), whereas SDAVFs (like their cranial counterparts, the dural AV fistulas [DAVFs]) are fed by radiculomeningeal arteries (which are, in fact, similar to meningeal arteries). We will not discuss the pial AV malformations in this review but rather will focus solely on the dural AV shunts, (ie, those shunts that are fed by radiculomeningeal arteries and that lead to a retrograde drainage into the radicular veins toward the perimedullary veins). In a recent uniform classification of dural AV shunts,5 both cranial and spinal AV shunts can be categorized into 3 groups on the basis of the embryologic development of the venous drainage of the surrounding structures: the ventral, dorsal, and lateral epidural groups. Ventral epidural AV fistulas in 2 different patients. A and B, Early and late phases of an injection into a segmental artery with a shunt into the ventral epidural space (white arrows) with no reflux toward the cord. These shunts are classically asymptomatic. 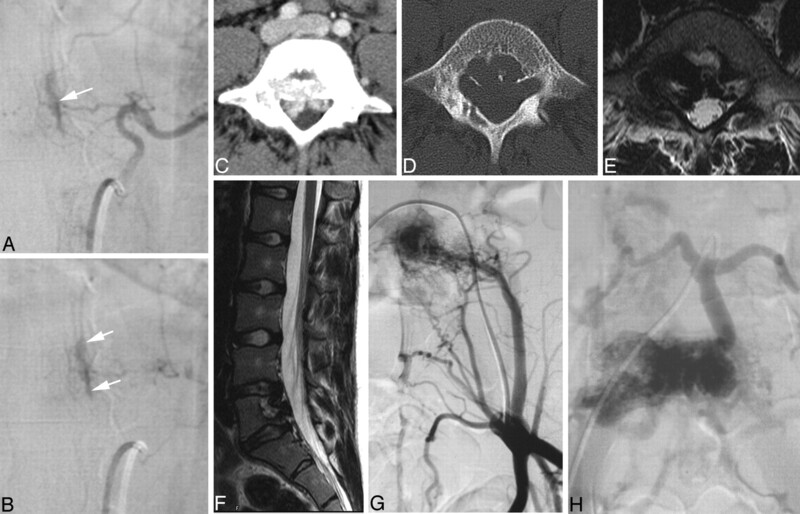 C−H, Enhanced CT (C), the bone window (D), axial (E) and sagittal (F) T2-weighted scans, and early (G) and late (H) phases of the iliac artery injections in an 18-year-old woman who had constant lumbago for the previous 2 years. A ventral epidural (or osteodural) shunt is demonstrated, which, despite its high-flow nature (usuration of the bone), does not lead to reflux toward the cord because the shunting vessels are related to structures developed from the notochord. The dorsal epidural group of AV shunts is related to veins that normally drain the spinous process and lamina at the spinal level. Although they are related to the major dural venous sinuses (superior sagittal sinus and torcular and transverse sinuses) at the cranial level, the corresponding veins at the spinal level are poorly developed4 and consist of a pair of longitudinal channels (ie, the posterior internal venous plexus). Patients with dural AV shunts within this space typically present with spontaneous epidural hematomas.20,21 These shunts are extremely rare. The most common “classic” types of SDAVFs are the lateral epidural DAVFs. These AV shunts develop in the lateral epidural space at the junction of the bridging (or radicular) veins that connect the spinal cord drainage to the epidural venous system. Outflow obstruction of its adjacent venous outlet, either due to thrombosis or fibrosis related to aging, will then lead to immediate drainage into the perimedullary veins. 5 As a result, patients within this group present with aggressive clinical symptoms and at an older age. A strong male predominance is also observed,22 which is similar to that in the cranially located lateral epidural DAVFs, such as in the foramen magnum (medulla bridging vein) and tentorial (petrosal bridging vein) locations. Below, we will focus only on the latter “classic” form of dural AV shunt of the spine because it represents >90% of all spinal dural AV shunts, whereas the remainder are only seldom encountered and, if so, rarely present with clinically significant symptoms. T2-weighted (A−C) and T1-weighted images following contrast enhancement (D−F) in 3 different patients demonstrate the spectrum of characteristic findings of SDAVFs on routine sequences. A centromedullary edema and perimedullary dilated vessels are the hallmark findings. However, even in the absence of edema (B) or in the absence of pathologic vessels on T2-weighted scans (C), the suspicion of an SDAVF is raised due to the coiled vessels seen on T1-weighted scans after contrast enhancement. While a missing edema might indicate a DAVF picked up early in the course of the disease, the missing flow voids on T2-weighted scans indicate a slow-flowing shunt. When comparing a routine T2 TSE (A) sequence and a heavily T2-weighted (FIESTA, 3D T2 TSE, or CISS) sequence (B), the former depicts the cord edema better (arrow, A), whereas the latter is better suited to demonstrate the perimedullary flow voids (arrow, B), as seen in this patient. On T1-weighted scans, the swollen cord is slightly hypointense and enlarged. 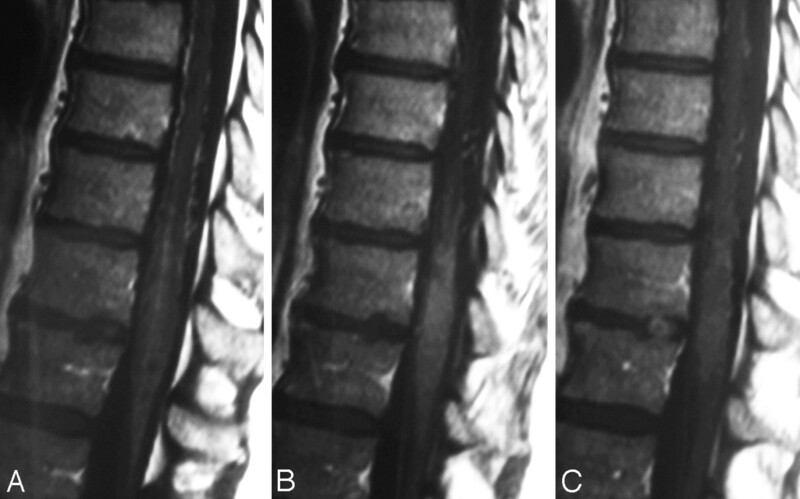 Following contrast administration, diffuse enhancement may be seen within the cord as a sign of chronic venous congestion with a breakdown of the blood−spinal cord barrier (Fig 4).49,50 SDAVFs may occur anywhere from the level of the foramen magnum to the sacrum and localization of these lesions may be difficult and challenging, especially in cases in which cord edema occurs distant from the AV shunt location.51 Thus, the noninvasive evaluation of the shunt location is extremely helpful to guide the invasive conventional angiography.52 Spinal contrast-enhanced MRA has greatly contributed to localizing these lesions and helping to avoid unnecessary superselective injections of all possible arterial feeders. 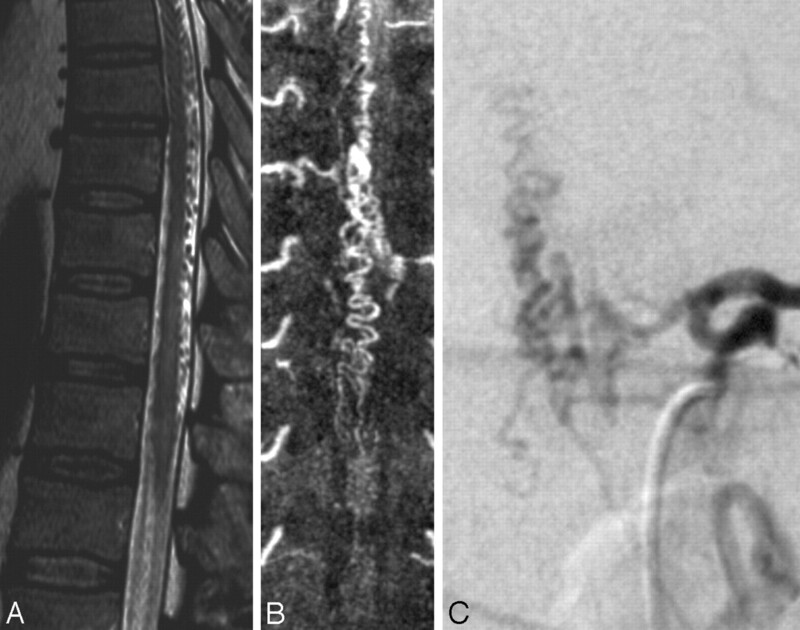 The technique of first-pass gadolinium-enhanced MRA can clearly demonstrate the early venous filling, thereby confirming the shunt, and, in most cases, can also demonstrate the level of the shunt (Fig 5).53-56 Spinal CT angiography has also been shown to demonstrate the fistula localization57; however, given the potential location from the foramen magnum to the sacrum, it may lead to a large radiation burden for the patient and, in our experience, does not constitute a practical approach to localizing SDAVFs. 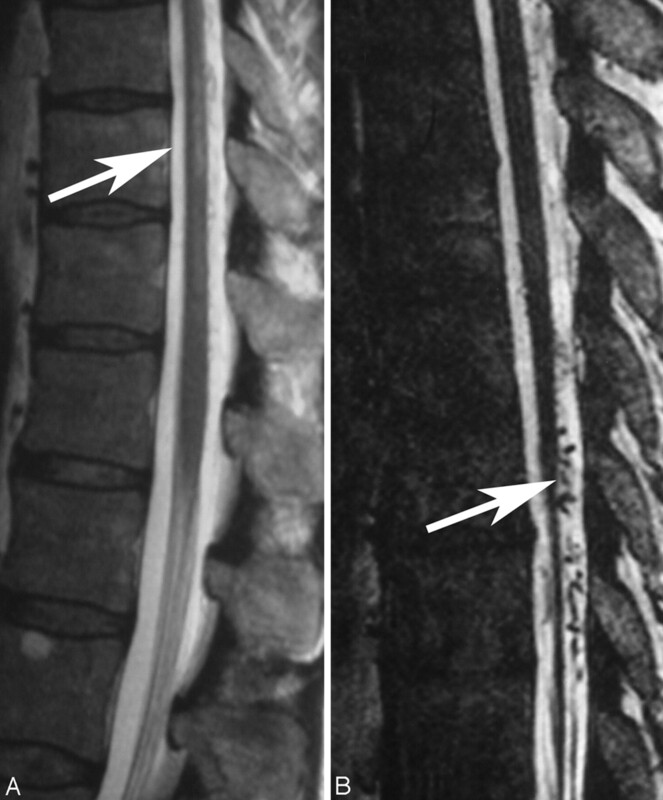 Following contrast enhancement, not only are the dilated perimedullary vessels depicted but sometimes (especially in the later stages of the disease) diffuse enhancement may be seen within the cord as a sign of chronic venous congestion with breakdown of the blood−spinal cord barrier. First-pass contrast-enhanced MRA can clearly demonstrate the early venous filling and thereby confirm the presence of a shunt in equivocal cases. A and B, On T2-weighted scans (A), the perimedullary flow voids indicate an SDAVF, which is confirmed on coronal spinal MRA (B). C, In addition, as indicated in this patient, MRA helps to demonstrate the level of the shunt, thereby directing the subsequent spinal DSA. On selective angiography, stasis of contrast material in the radiculomedullary arteries,7 especially the anterior spinal artery, can be seen. The delayed venous return following ASA injection indicates venous congestion and underlines the necessity to search for a shunting lesion, whereas in most cases, a normal venous return following injection of the anterior spinal artery (ASA) will exclude the possibility of an SDAVF (Fig 6).30 After injection into the segmental artery harboring the AV fistula, the early venous filling and the retrograde contrast uptake of the radiculomedullary veins are visualized. Often an extensive network of dilated perimedullary veins is visible. This network may even recruit supply from dural arteries that ascend or descend from neighboring radiculomeningeal arteries. In rare cases, the flow from the radiculomeningeal artery into the radicular vein may be slow; therefore, we classically perform spinal angiographies to search for DAVFs with a low frame rate (1 image/second) and hold for at least 4 seconds to exclude delayed retrograde filling of the radicular veins. In patients with spinal AV shunts, the venous return after injection into the ASA is delayed due to the arterialized pressure in the spinal cord veins. Therefore, stasis following injection into the segmental artery from which the ASA originates is seen as in this patient. A, The arrow demonstrates the hairpin curve of the ASA visible in the early arterial phase. B, The late venous phase still demonstrates contrast material within the ASA, which should have been washed out by this time under physiologic conditions (arrowheads). C, The reason for the delayed washout is a DAVF at a different level, leading to massive venous congestion. 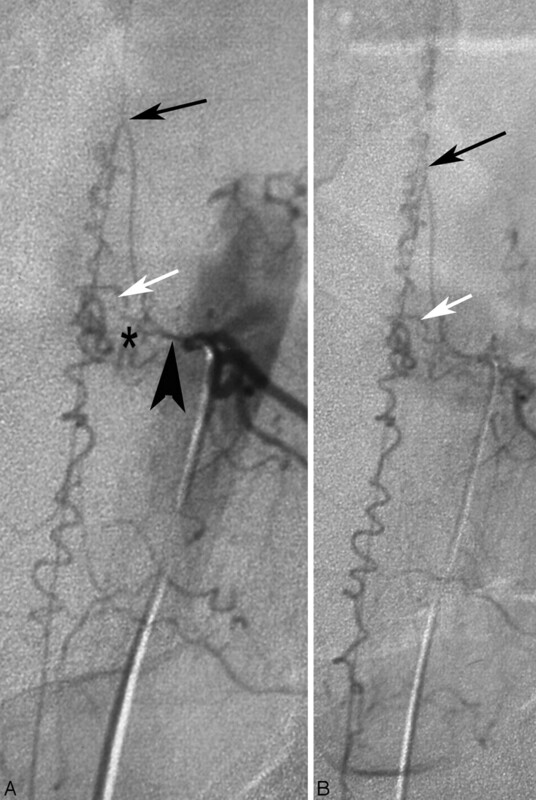 Endovascular therapy in DAVFs in 2 different patients (A−C and D−F, respectively). A and D demonstrate the global injections verifying that no supply to the spinal cord is present from the pedicle from which the spinal DAVF is fed. The superselective injections demonstrated on B and E show the feeding artery (black arrow), the shunting zone (asterisk), and the proximal draining vein (white arrow). For an embolization to be effective, the glue has to penetrate from the artery via the shunting zone into the vein. C and F, Respective glue casts in both patients: While in the first patient (C) the glue cast did not reach the vein, in the second patient, the glue is visible within the proximal vein. The first patient will necessarily demonstrate recanalization with neurologic deterioration following a period of transient improvement of symptoms, due to the vast collaterals present in the dura, which will reconstitute the fistula. We would, therefore, strongly recommend early surgery (ie, in the same hospital setting). The patient seen in the lower row, though, is completely cured. Images of this patient with the classic MR imaging findings of a DAVF on T1-weighted contrast-enhanced (A) and T2-weighted (B) scans demonstrate a vast network of dural collateral arteries in the shunting zone. Although the main supply to the shunt is derived from the radiculomeningeal artery originating from the injected segmental artery (arrowhead), there is an additional supply ascending from a lower segmental artery (small arrow) that is filled via longitudinal collaterals. The shunting zone is denoted by an asterisk. Only if the liquid embolic agent penetrates into the draining veins will this patient be cured; a proximal occlusion will invariably lead to refilling of the shunt via dural collaterals. The success rates of endovascular therapy have been reported to vary between 25% and 75%,43,66 whereas a recent meta-analysis suggested complete occlusion of the fistula following surgery in 98%.67 If the glue does not reach the venous site, we strongly advocate early surgical intervention because a recent study has shown that patients in whom the endovascular occlusion was incomplete and who required surgical intervention had a bad clinical outcome, which was likely due to the delay of the secondary intervention.68 The treatment strategy that is adopted by most centers currently includes a tentative embolization if this is believed to be a safe approach (ie, no spinal cord−supplying artery that may arise from the same pedicle as the feeder to the shunt as present in Fig 9). 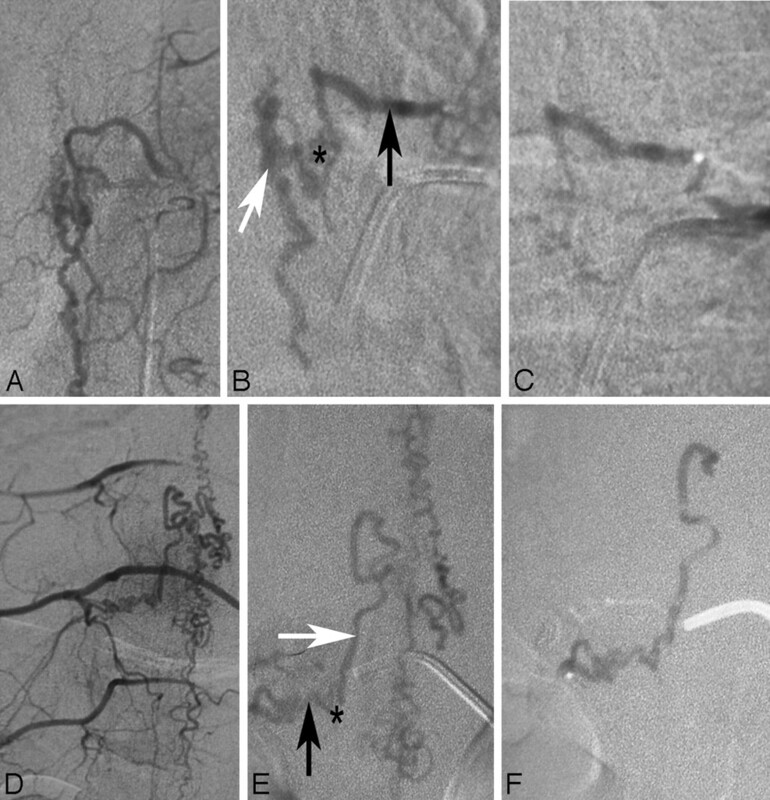 If the liquid embolic agent penetrates into the vein, long-term clinical follow-up has proved to result in complete obliteration of the fistula and good clinical outcome.69 If the glue stays intra-arterial, the liquid embolic agent may at least be used to label the feeding artery internally and thereby ease intraoperative fluoroscopic localization of the exact height of the fistula. In the authors’ experience, a slow continuous injection of liquid glue (2 parts of iodized oil [Lipiodol; Guerbet, Aulnay-sous-Bois, France] and 1 part of glue) has a high chance to reach the draining vein and obliterate the fistula. In rare cases, the anterior spinal artery (black arrow) may arise from the same pedicle as the feeder to the shunt (shunting zone, asterisk; draining vein, white arrow). The anterior spinal artery can be identified by the following: 1) its ascending course along the nerve root, 2) its hairpin course at the midline, and 3) the straight course once it reaches the midline of the cord. The vein does not reach the midline via the ascending nerve root but instead via a horizontal and more tortuous course. 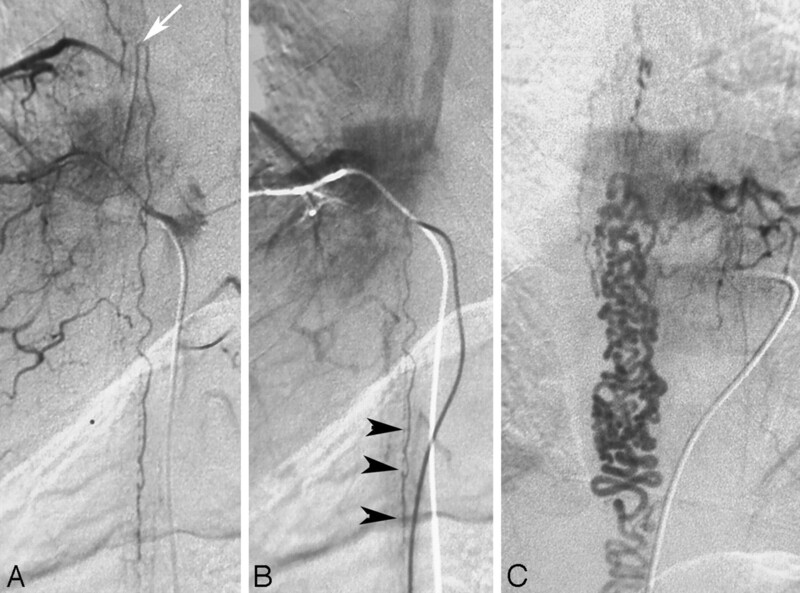 Embolization in patients with this condition is extremely dangerous, and surgical options may be considered a safer approach. SDAVF is a rare but treatable cause of otherwise progressive paraplegia. The neuroradiologist plays a major role in the detection of these lesions and in their treatment, which should be aimed at occluding the proximal portion of the vein together with the distal arterial segment. Neurologic symptoms are unspecific; however, the MR imaging trias of cord edema, perimedullary vessels, and contrast enhancement of the cord in elderly men should lead to the diagnosis, which should be confirmed by selective DSA, preferably following guidance toward the fistula localization by contrast-enhanced MRA. The authors are indebted to their clinical and neuroradiologic teachers, Drs Armin Thron (Aachen), Sirintara Pongpech (Bangkok) and Pierre Lasjaunias (Paris), to whom we dedicate this article posthumously. Accepted after revision December 2, 2008.